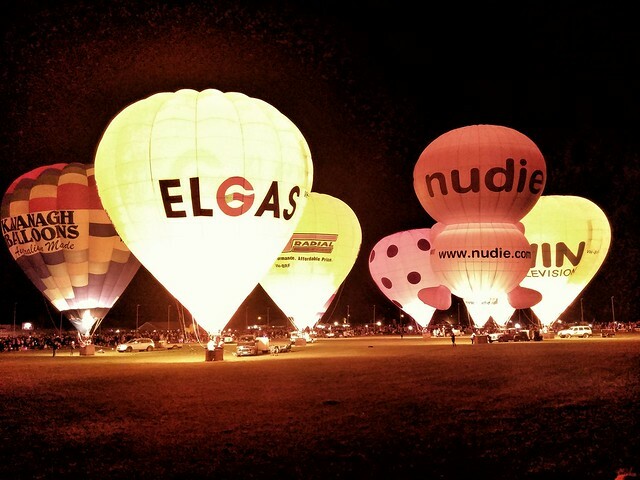 I’d heard about this event – the Balloon Glow – a couple of years ago and went to see it but was a day late. This year, I heard about it again via a photography group I’m in and thought I’d drag the lad out to see it with me. A friend came along as well. I didn’t bother hooking up with the photography group in the end. Once I saw the amount of people I didn’t even try. We got there about 5pm and realised that it was a very popular event by the amount of cars crawling the area looking for a park. I managed to find a park a few blocks away and walked there. While we lined up a very stressed mum walked past us with her baby in the pram and toddler whinging next to her. We heard her say, ‘Well we’re not going back. There’s so many rude and inconsiderate people in there.’ It didn’t bode well. We paid our entry fee and walked in and saw queues of people surrounding us. I saw the longest queue for the toilets I’ve ever seen anywhere. We thought we’d get some fresh donuts but saw the queue for that and decided against it. My son and my friend bought a hot chocolate – surprisingly there was no queue for that – but I declined because I didn’t fancy queuing for the loos afterwards. My first thought was that this event was really badly organised but then I realised that there’s no way they’d expected this amount of people as they obviously hadn’t catered for them. There were no portable toilets anywhere and there definitely wasn’t enough food and beverage stalls to cater for the crowds. While we waited for the balloons to arrive on the oval and be inflated, the lad decided he was bored and would like to go and get some donuts so I handed him some cash and let him go. Bless him, he came back with some just as the balloons were being inflated. We were told to not stand on the dog track so everyone moved back off it. Then we were told that we could indeed stand there, so maybe it was a bit disorganised after all. All that aside, it was pretty spectacular. We had to stand back to start with and then were allowed on the oval to get up close. It’s then you realise just how big these balloons are, and how hot and big that flame is to keep the thing inflated. There was no reason to hang around after the light show so off we went to buy some food. We went past the busy pub and settled for the not so busy one around the corner. I think they need Gordon Ramsay in there to roust them up. The service was abysmal, and the wait for the food was long. And the choice of food was schnitzel, steak or various forms of fried seafood. The one special – lamb shanks – were all sold out by the time we ordered so I had fish and chips. So, it was an interesting evening in seeing how bad organisation is done with some pretty lights thrown in.